I came across a really great article last week that researched brain activity when we multitask. Most people assume that multitasking is a really helpful thing. We assume by doing more than one thing at a time, we are being more productive and accomplishing more. Students who engaged heavily in multitasking activities felt great, but their results were much worse than that of people who didn’t multitask….. If we have lunch, 5 Facebook chat windows open and also try to send off an email, it isn’t that our brain focuses on all these activities at the same time. Instead, multitasking splits the brain. It creates something researchers have called “spotlights”. So all your brain is doing is to frantically switch between the activity of eating, to writing an email, to answering chat conversations. 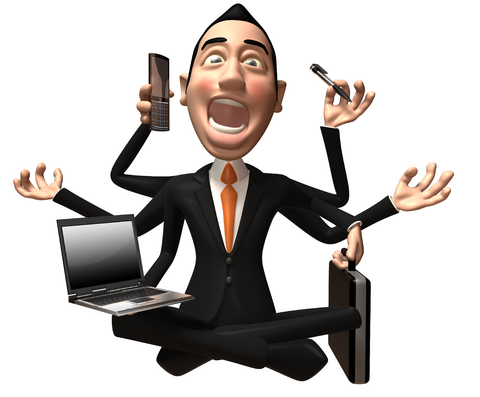 Multitasking gives the illusion of productivity, but it is actually lowering our ability to actually produce. Instead of giving our full attention to several different things, our attention is fractured and nothing gets the attention it actually deserves. Widerich goes on to explain that multitasking actually lowers our ability to filter information, switch quickly between tasks, and lowers our working memory. We are losing some of the very things we were hoping to accomplish by multitasking. Another problem a study found, is that multitaskers seem very efficient from the outside, so we want to be like them. We see someone who can juggle emailing, doing phone calls and writing a blogpost on the side and feel “wow”, that is incredible. I want to be able to do that too! So very unknowingly we put a lot of pressure onto ourselves to juggle more and more tasks. When really, it only seemingly makes us more productive. Multitasking makes us feel important. But at the same time is robbing us of giving the proper importance to important things. Thinking through the implications of this could take up a week or two of blog posts, but let me offer three quick ideas on how to navigate some of this. 1. Give priority to in-person conversations. Texting, Facebooking, and emailing during an in person conversation makes us feel important. But what it actually does is communicate that the person in front of us is not as important. The digital relationships can wait. Honor the time they made to be present with you. 2. Avoid the comparison trap. Just because it looks like other people are more important and are doing more, doesn’t necessarily make it true. When we compare our productivity or number of relationships to others, we are always playing a losing game. All that matters is who YOU can be present to and focus on in THIS moment. 3. Be like Jesus. When we stop trying to impress people, or stop doing things to make ourselves feel important, relationships change. When I am concentrating on how I can bless a person I am with and not what I get from the conversation, a lot of these problems fix themselves. This entry was posted in Depth, Relationships, Technology and tagged Comparison, Importance, Multitasking, Relationships. Bookmark the permalink. Very good points, Trevor. I find it very irritating to try to have a conversation with a person while they are eyeing their mobile device. It makes me feel insecure, irritated, and unimportant. Unfortunately, I have been guilty of doing the same thing! Lately, I have started ignoring my device while eating, chatting, or even having my hair cut. It is surprising how often people will ask, “Do you need to get that?” so I am thinking I will mute it from now on. Thanks for what you guys are bringing to discussion. Thanks Deborah! The idea of a device keeping us from giving attention to others really struck me because I am so guilty of it. It is a frequent occurrence where my wife will talk to me while I am on my phone and I will have little to no idea about what she said. Nobody is getting the attention they deserve, so I am working on these three constantly. Thanks for your thoughts! I am a great multi-tasker. And I agree with the article. I’m great at getting a lot of things done at the same time and in a shorter amount of time, but IT IS EXHAUSTING! I have been taking baby steps towards living in a way that doesn’t require me to multi-task my life away. With the exception of Benny calling, I do not take phone calls when I’m already having a conversation – whether I’m in person or already on a call. I hate call waiting. It’s evil. 😉 Here’s my other secret: I am a multi-tasker because I am also a procrastinator. I end up juggling too many things because I’ve put them off until the last possible second. I operate with split brain a lot and it’s robbing me of my peace. I’m working on that.